The Interstate Compact, approved by Congress in 1940, established ICPRB. It was a response to the extreme pollution in the river, and recognized that addressing the problem would require a coordinated effort among the Potomac jurisdictions. It was modified in 1970 to include cooperative water supply and other natural resources issues. This document is an electronic version of the language the U. S. Congress used in adopting the 1970 amendment for the Compact creating the Interstate Commission on the Potomac River Basin. Any discrepancy or difference in language is not intended. If there is a discrepancy the language in the official records of the United States Congress will prevail. 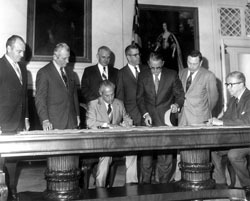 Granting the consent of the Congress to the States of Maryland and West Virginia and the Commonwealths of Virginia and Pennsylvania and the District of Columbia, as signatory bodies, for certain amendments to the compact creating the Potomac Valley Conservancy District and establishing the Interstate Commission on the Potomac River Basin. Now, therefore, the States of Maryland and West Virginia, the Commonwealths of Pennsylvania and Virginia, and the District of Columbia, hereinafter designated signatory bodies, do hereby create the Potomac Valley Conservancy District, hereinafter designated the Conservancy District, comprising all of the area drained by the Potomac River and its tributaries; and also, do hereby create, as an agency of each signatory body, the Interstate Commission on the Potomac River Basin, hereinafter designated the Commission, under the articles of organization as set forth below. The Interstate Commission on the Potomac River Basin shall consist of three members from each signatory body and three members appointed by the President of the United States. Said Commissioners, other than those appointed by the President, shall be chosen in a manner and for the terms provided by law of the signatory body from which they are appointed and shall serve without compensation from the Commission but shall be paid by the Commission their actual expenses incurred and incident to the performance of their duties. (A). The Commission shall meet and organize within thirty days after the effective date of this compact, shall elect from its number a chairman and vice-chairman, shall adopt suitable bylaws, shall make, adopt and promulgate such rules and regulations as are necessary for its management and control, and shall adopt a seal. (B). The Commission shall appoint and, at its pleasure, remove or discharge such officers and legal, engineering, clerical, expert and other assistants as may be required to carry the provisions of this compact into effect, and shall determine their qualifications and fix their duties and compensation. Such personnel as may be employed shall be employed without regard to any civil service or other similar requirements for employees of any of the signatory bodies. The Commission may maintain one or more offices for the transaction of its business and may meet at any time or place within the area of the signatory bodies. (C). The Commission shall keep accurate accounts of all receipts and disbursements and shall make an annual report thereof and shall in such report set forth in detail the operations and transactions conducted by it pursuant to this compact. The Commission, however, shall not incur any obligations for administrative or other expenses prior to the making of appropriations adequate to meet the same nor shall it in any way pledge the credit of any of the signatory bodies. Each of the signatory bodies reserves the right to make at any time an examination and audit of the accounts of the Commission. (D). A quorum of the Commission shall, for the transaction of business, the exercise of any powers, or the performance of any duties, consist of at least six members of the Commission who shall represent at least a majority of the signatory bodies: Provided, however, That no action of the Commission relating to policy or stream classification or standards shall be binding on any one of the signatory bodies unless at least two of the Commissioners from such signatory body shall vote in favor thereof. (A). To collect, analyze, interpret, coordinate, tabulate, summarize and distribute technical and other data relative to, and to conduct studies, sponsor research and prepare reports on, pollution and other water problems of the Conservancy District. (B). To cooperate with the legislative and administrative agencies of the signatory bodies, or the equivalent thereof, and with other commissions and Federal, local governmental and non-governmental agencies, organizations, groups and persons for the purpose of promoting uniform laws, rules or regulations for the abatement and control of pollution of streams and the utilization, conservation and development of the water and associated land resources in the said Conservancy District. (C). To disseminate to the public information in relation to stream pollution problems and the utilization, conservation and development of the water and associated land resources of the Conservancy District and on the aims, views, purposes and recommendations of the Commission in relation thereto. (D). To cooperate with, assist, and provide liaison for and among, public and non-public agencies and organizations concerned with pollution and other water problems in the formulation and coordination of plans, programs and other activities relating to stream pollution or to the utilization, conservation or development of water or associated land resources, and to sponsor cooperative action in connection with the foregoing. (E). In its discretion and at any time during or after the formulation thereof, to review and to comment upon any plan or program of any public or private agency or organization relating to stream pollution or the utilization, conservation or development of water or associated land resources. (F) (1). To make, and, if needful from time to time, revise and recommend to the signatory bodies, reasonable minimum standards for the treatment of sewage and industrial or other wastes now discharged or to be discharged in the future to the streams of the Conservancy District, and also for cleanliness of the various streams in the Conservancy District. (2). To establish reasonable physical, chemical and bacteriological standards of water quality satisfactory for various classifications of use. It is agreed that each of the signatory bodies through appropriate agencies will prepare a classification of its interstate waters in the District in entirety or by portions according to present and proposed highest use, and for this purpose technical experts employed by appropriate state water pollution control agencies are authorized to confer on questions relating to classification of interstate waters affecting two or more states. Each signatory body agrees to submit its classification of its interstate waters to the Commission with its recommendations thereon. The Commission shall review such classification and recommendations and accept or return the same with its comments. In the event of return, the signatory body will consider the comments of the Commission and resubmit the classification proposal, with or without amendment, with any additional comments for further action by the Commission. It is agreed that after acceptance of such classification, the signatory body through its appropriate state water pollution control agencies will work to establish programs of treatment of sewage and industrial wastes which will meet or exceed standards established by the Commission for classified waters. The Commission may from time to time make such changes in definitions of classifications and in standards as may be required by changed conditions or as may be necessary for uniformity and in a manner similar to that in which these standards and classifications were originally established. It is recognized, owing to such variable factors as location, size, character and flow and the many varied uses of the waters subject to the terms of this compact, that no single standard of sewage and waste treatment and no single standard of quality of receiving waters is practical and that the degree of treatment of sewage and industrial wastes should take into account the classification of the receiving waters according to present and proposed highest use, such as for drinking water supply, bathing and other recreational purposes, maintenance and propagation of fish life, industrial and agricultural uses, navigation and disposal of wastes. For the purpose of dealing with the problems of pollution and of water and associated land resources in specific areas which directly affect two or more, but not all, signatory bodies, the Commission may establish Sections of the Commission consisting of the Commissioners from such affected signatory bodies: Provided, however, That no signatory body may be excluded from any Section in which it wishes to participate. The Commissioners appointed by the President of the United States may participate in any Section. The Commission shall designate, and from time to time may change, the geographical area with respect to which each Section shall function. Each Section shall, to such extent as the Commission may from time to time authorize, have authority to exercise and perform with respect to its designated geographical area any power or function vested in the Commission, and in addition may exercise such other powers and perform such functions as may be vested in such Section by the laws of any signatory body or by the laws of the United States. The exercise or performance by a Section of any power or function vested in the Commission may be financed by the Commission, but the exercise or performance of powers or functions vested solely in a Section shall be financed through funds provided in advance by the bodies, including the United States, participating in such Section. The pro rata contributions shall be based on such factors as population; the amount of industrial and domestic pollution; and a flat service charge; as shall be determined from time to time by the Commission, subject, however, to the approval, ratification and appropriation of such contribution by the several signatory bodies. 1. Faithful cooperation in the abatement of existing pollution and the prevention of future pollution in the streams of the Conservancy District and in planning for the utilization, conservation and development of the water and associated land resources thereof. 2. The enactment of adequate and, insofar as is practicable, uniform legislation for the abatement and control of pollution and control and use of such streams. 3. The appropriation of biennial sums on the proportionate basis as set forth in Article IV. This compact shall become effective immediately after it shall have been ratified by the majority of the legislature of the States of Maryland and West Virginia, the Commonwealths of Pennsylvania and Virginia, and by the Commissioner of the District of Columbia, and approval by the Congress of the United States: Provided, however, That this compact shall not be effective as to any signatory body until ratified thereby. Now, therefore, be it resolved by the Senate and House of Representatives of the United States of America in Congress assembled, That the consent of the Congress is hereby given to the States of Maryland and West Virginia and the Commonwealths of Virginia and Pennsylvania and the District of Columbia to adopt the aforementioned amendments and enter into the amended compact hereinbefore recited and every part and article thereof: Provided, That nothing contained in such amended compact shall be construed as impairing or in any manner affecting any right or jurisdiction of the United States in and over the region which forms the subject of this compact: And provided further, That the consent herein given does not extend to section (F) (2) of article II of the amended compact. Sec. 2. The Commissioner of the District of Columbia is authorized to enter into, on behalf of the District of Columbia, the amended compact hereinbefore recited. Sec. 3. The right to alter, amend, or repeal this joint resolution is hereby expressly reserved.